Congratulations to the JA Lady Raiders! 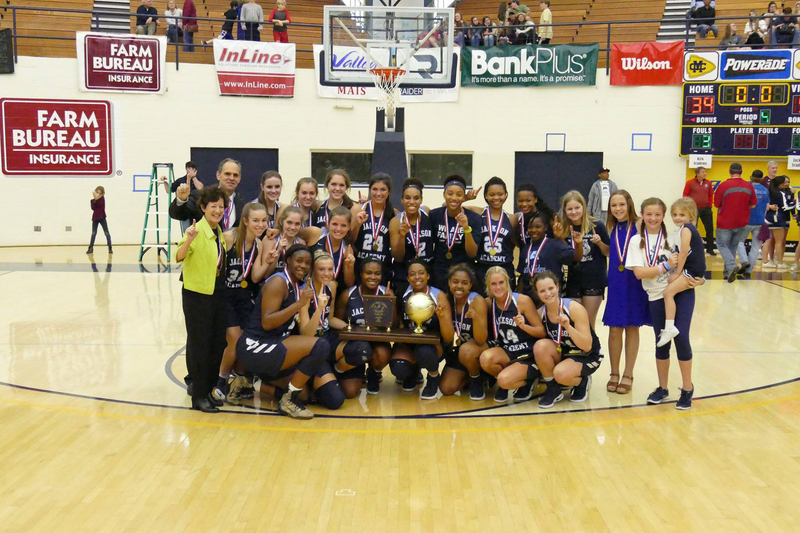 The team attained its 40th win and the MAIS Overall Championship title at Mississippi College Saturday. The Lady Raiders defeated Kirk Academy 52-39 for the title. Named to the MAIS Overall All Tournament Team were De’ja Bradford, Conley Chinn, Emily McNair, Lauran Sheriff, and Malon Stratton. The Lady Raiders won 59-25 in Monday’s game against Leake to advance to the second round of the overall tournament. Wins against Oak Forest (58-28) on Wednesday and Marshall (40-15) on Friday earned the team a spot in the championship game. The boys varsity team advanced to the overall tournament, winning their first round game against Canton Academy 57-48. In the second round, they had a 70-44 win over Riverdale and ended their season in a 63-61 loss to Hartfield in the third round. Micah Morgan was named to the All Tournament team.